Prepare to get stuck in a time loop for true love with the OPPOSITE OF ALWAYS movie! Smash debut YA novel Opposite of Always by Justin A. Reynolds will be ushered to the screen by a respected production banner known for young adult adaptations! The wild time-travel romance (and five-star read, in our opinion!) follows Jack, a high school senior whose life is forever changed when he meets Kate at a party at his future college. Over the course of the next few months, Jack falls madly in love with Kate, and everyone else in his life does too. When Kate dies unexpectedly, it feels like Jack’s world is going to end. Instead, it starts over. Jack is transported back to the party at which he met Kate over and over, desperately trying to figure out how to save her over the course of a few months. But the butterfly effect is real and everything he does differently has serious effects on his friends, family, and Kate. Can he be Kate’s hero without sacrificing everyone else in his life? 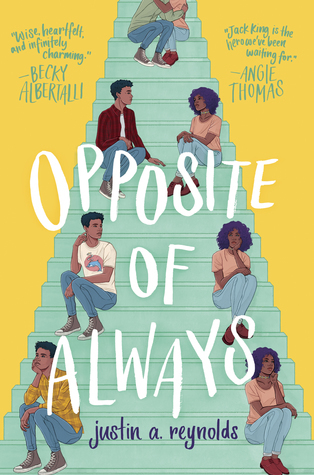 According to Deadline, Opposite of Always has been optioned by Paramount Players in conjunction with Temple Hill Entertainment, the production company behind The Hate U Give, The Fault In Our Stars, The Maze Runner series, Love Simon, and other YA novel adaptations. We’ll keep you updated on movie news, but in the meantime, you should absolutely pick up this gem of a book via Amazon or by supporting your local bookstore via Indiebound!